Cooked over a hot cedar plank, the salmon acquires a smoky flavor and a slighty aromatic overtone that enhances any piece of fish. Prior to grilling, soak grilling plank in water for 2 hours. Plank must be totally submerged. Use a weight such as a rock or cans of food to keep it fully immersed in water. Prior to cooking, rub a clove of garlic over surface of plank on which fish is to be placed and then brush the same surface with a coating of olive oil. Wash fish steaks with cold water. Brush each side of each steak with a coating of olive oil. Preheat grill to 350Âº F. on medium-high heat setting. Place damp plank with fish on grill near or almost over heat source so plank can be evenly and well heated, but not so much that the wood ignites. Close grill hood. (As a precaution, keep a spray bottle of water near the grill to extinguish any flames from board burning.) Check periodically to make sure plank is only smoking and not burning. Grill salmon for 20 to 30 minutes depending on the intensity of the heat that directly cooks the fish. When salmon steaks flake easily into large chunks and internal temperature reaches 135Âº F, salmon should be finished cooking. Use caution when removing planks and fish from grill, since planks may be very hot. 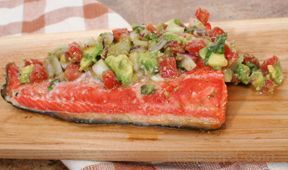 Use grill mitts or turn off grill heat, use a spatula to remove salmon steaks, and allow plank to cool before removing. The measures provided will make enough for 4 servings so alter amounts if desired. Cut avocado, tomato and onion into small chunks. Chop cilantro into pieces and combine with avocado, tomato, onion and lime zest. Whisk lime juice and oil. Then drizzle over salsa mixture. Cover and let stand in refrigerator for at least one hour before serving.